Look! 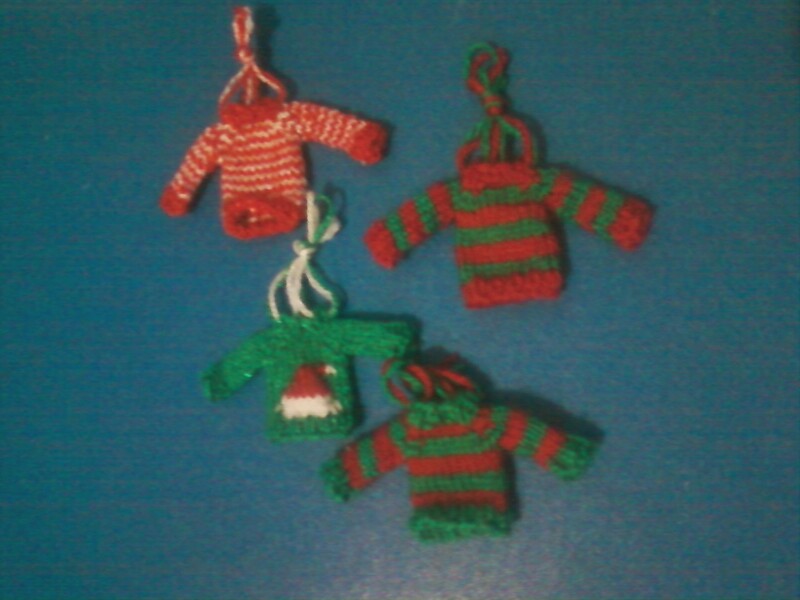 I Made Stuff | I knit, crochet, spin, cook, bake, craft, write, think, struggle with adulthood, etc. I, like many knitters, tend to knit faster when I am experiencing strong emotions. 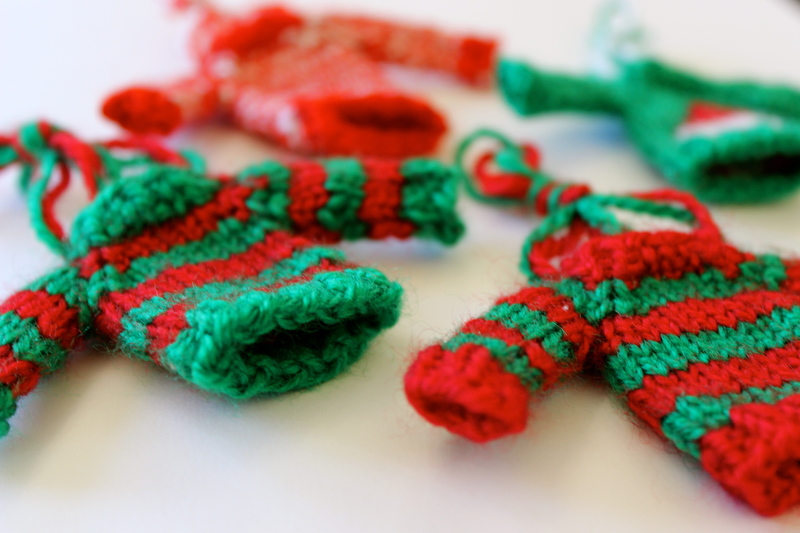 I zoom through projects while watching action flicks, and stress-knit at the speed of light. I had a job interview in Maine yesterday. It was stressful and fun and scary and VERY exciting. I brought this simple sock along for the plane ride, de-stressing, etc. On Thursday afternoon, I was in the middle of the gusset increases – at around the bright green stripe in the middle of the foot. I cast off today. Most of that sock you see right there was done within 48 hours. 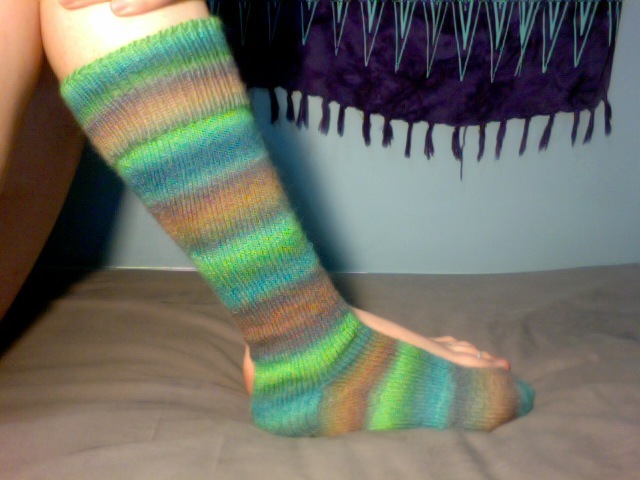 I don’t think I’ve ever knit a sock that big and that fast. Lesson learned: never underestimate the power of stress knitting! 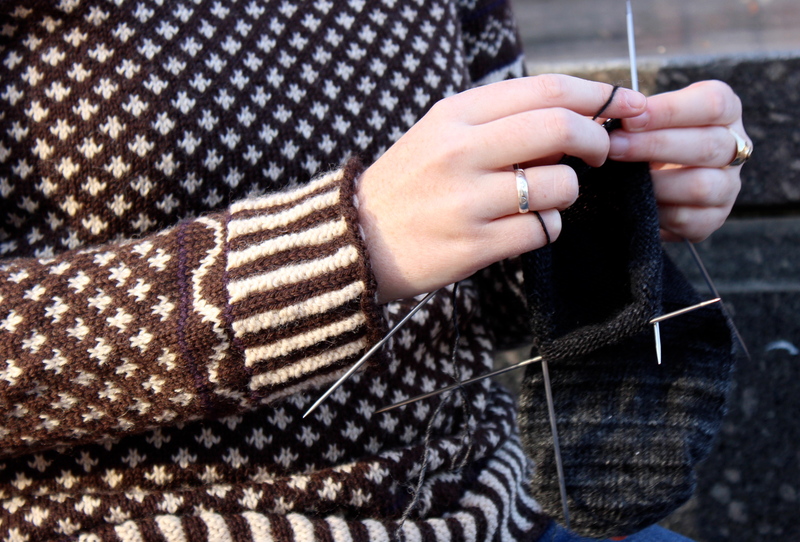 Pattern: super-basic toe-up sock recipe with a wedge toe and slip stitch heel. Yarn: Jawoll Magic. I. Love. This. Yarn. Eat lots of delicious things, tell the people you love that you love them and are grateful for them, and have a wonderful holiday! Happy Thursday! Go knit something pretty. My loving family, and their practically unending faith in me. My most excellent friends, who support me 100% and are also great company. 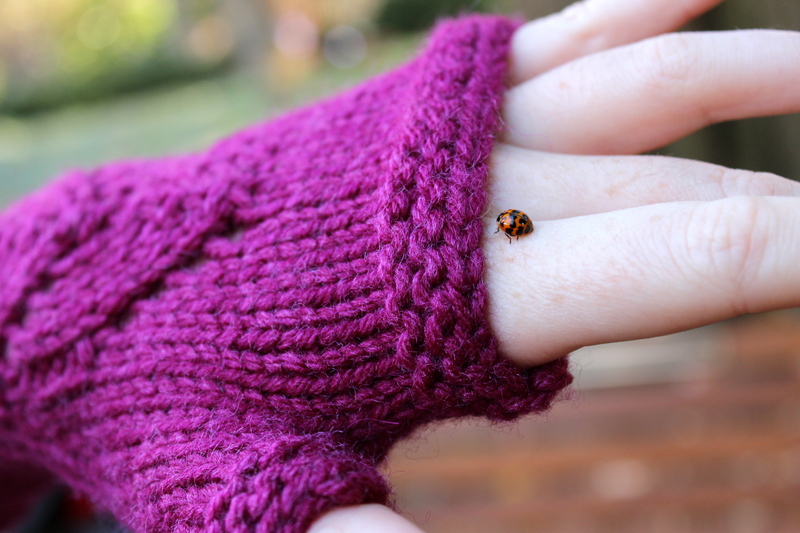 The good fortune that allows me to be warm, fed, and loved this winter. Yarn, for the infinite possibility it contains, and the endless hours of entertainment it provides. It snowed last night and was under 30 degrees Fahrenheit all day so I haven’t left the apartment yet today. I have, however, had a very productive day in my PJs. If it weren’t so darned cold, I would be well on my way to falling in love with the lovely city of Madison, WI. I went to a gourmet cheese shop yesterday. It was divine. The charming and handsome sales clerks must have either tried to hit on us or thought we were an adorable lesbian couple. Either way, the end result was a million free samples of delicious cheese. My most excellent photographer, Emmie, sent me the cream of the crop from last week’s photo shoot in preparation of the opening of my Etsy shop. Would you like a sneak peak? Of course you would. Pattern is my own design. The brim is a super bulky navy/pale blue 2ply in a simple feather-and-fan lace, which I did until I ran out of yarn, and the rest is straight stockinette in a bulky dark gray. It’s delightfully thick and warm, and kind of tight on my head so it feels like a warm head hug. I noticed as I was packing for this trip that I didn’t have any warm hats. 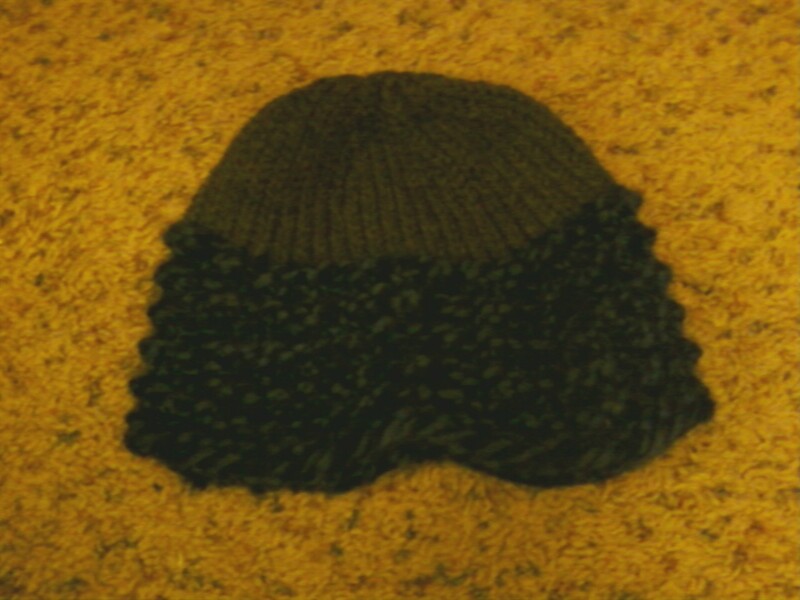 So, being a knitter, I packed yarn and some needles and before long I’d figured out a hat. I started knitting this hat on the flight to Cleveland and finished sewing it up on the train from the airport to the bus stop in Chicago. Just in time, too, because Chicago was SO COLD. I am extremely happy to have this warm hat now that I’m in the frozen north, and also very happy that I’m a knitter and could make something so beautiful, comfortable, and functional for myself on such short notice. What do the muggles do when they’re cold and hat-less? In other news, I’m leaving tomorrow to visit my darling friend in Wisconsin. Blogging might be spotty but I’ll try very hard to say hello regularly! I’m leaving on Saturday for a trip to Wisconsin to visit my darling friend, and I just realized that I don’t have a warm winter hat. Good thing I’m a knitter.